Generally use a relatively simple process, after a period of grinding, the fineness of -200 mesh about 50% to 70% and 1 rough election, 2 or 3 times fine selected, 1 or 2 times scavenging . Disseminated copper minerals such as relatively small size, may consider the stage of grinding and separation processes. To deal with the concentrator bornite, and then concentrate most of the use of coarse grinding - grinding stage of selection of election processes, and its essence is mixed - priority flotation process. First by a section of coarse grinding, roughing, sweep the election, and then regrinding of rough throughout the mine re-election to be high-grade copper concentrate and sulfur concentrate. Coarse ground mesh -200 degrees about 45% ~ 50%, then fine mesh -200 degrees about 90% ~ 95%. Dense as a result of copper ore and pyrite chalcopyrite symbiotic dense, pyrite is often secondary copper-activated pyrite with a high level and difficult to curb, separation difficulties. Sorting requirements of the process of copper concentrate and sulfur at the same time concentrate. Usually after the election of copper ore tailings is sulfur. If the content of gangue minerals in more than 20% to 25%, in order to get sulfur concentrate, also need to separation again. 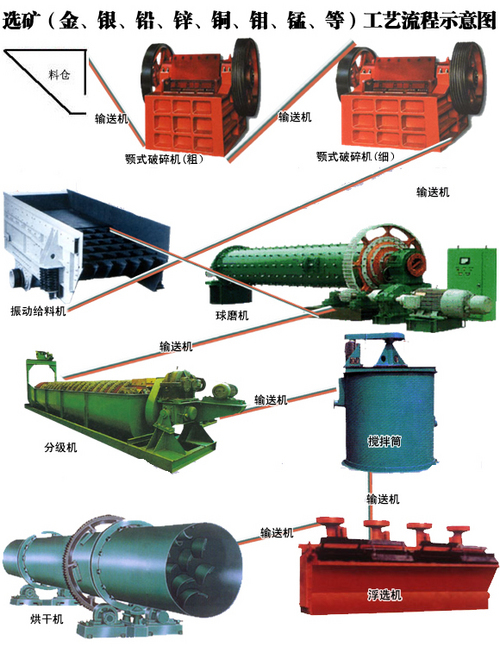 Dense copper ore processing, often using two stages of grinding or grinding, grinding fineness smaller requirements. Pharmacy is also a larger amount, the amount of xanthate 100g / (t original ore) above, lime 8 ~ 10 kg (t original ore) above.